Are the laboratory results really true? Can the laboratory accurately analyze sample products like my sample? Can the laboratory reproduce the sample results for my type of sample? Now let’s discuss the most important QC test that will protect your crop and business. That QC sample is the Matrix Sample. In the last article in this series, you were introduced to many QC samples. The Matrix Sample and Duplicate were some of them. Take a look back at Part 3 to familiarize yourself with the definitions. Your sample is analyzed by the laboratory as received. Then a sub-sample of your sample is spiked with a known concentration of the analyte you are looking for (e.g. pesticides, bacteria, organic chemicals, etc.). The difference between the sample with and without a spike indicates whether the laboratory can even find the analyte of concern and whether the percent recovery is acceptable. 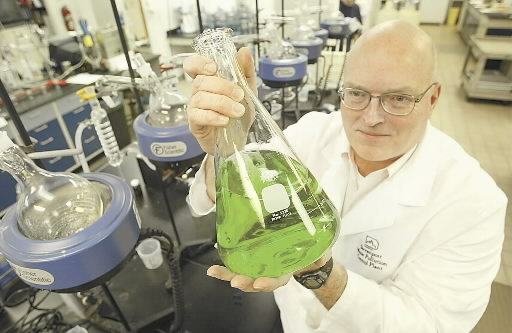 Laboratory 1 spiked a known amount of a pesticide into a wastewater matrix. (e.g. Silver into final treatment process water). The laboratory failed to recover any of the spiked silver. Therefore the laboratory results for these types of sample were not reporting any silver, but silver may be present. This is where laboratory results would be false negatives and the laboratory method may not work on the matrix (your sample) correctly. . Laboratory 2 ran an analysis for a toxic compound (e.g. Cyanide in final waste treatment discharge). A known amount of cyanide was spiked into a matrix sample and 4 times the actual concentration of that cyanide spike was recovered. This is where laboratory results would be called false positives and the laboratory method may not work on the matrix (your sample) correctly. Can the laboratory reproduce the results they reported to you? The laboratory needs to repeat the matrix spike analysis to provide duplicate results. Then a comparison of the results from the first matrix spike with its duplicate results will show if the laboratory can duplicate their test on your sample. If the original matrix spike result and the duplicate show good agreement (e.g. 20% relative percent difference or lower). Then you can be relatively sure that the result you obtained from the laboratory is true. But, if the original matrix spike result and the duplicate do not show good agreement (e.g. greater than 20% relative percent difference). Then you can be sure that the result you obtained from the laboratory is not true and you should question the laboratory’s competence. These matrix samples take too much time. These matrix samples add a cost that the laboratory cannot recover. These matrix samples are too difficult for the laboratory staff to perform. Most importantly: Matrix samples show the laboratory cannot perform the analyses correctly on the matrix. So, what types of cannabis matrices are out there? Some examples include bud, leaf, oils, extracts and edibles. Those are some of the matrices and each one has their own testing requirements. So, what should you require from your laboratory? The laboratory must use your sample for both a matrix spike and a duplicate QC sample. The percent recovery of both the matrix spike and the duplicate will be between 80% and 120%. If either of the QC samples fail, then you should be notified immediately and the samples reanalyzed. If the relative percent difference between the matrix spike and the duplicate will be 20% or less. If the QC samples fail, then you should be notified immediately and the samples should be reanalyzed. The impact of questionable laboratory results on your business with failing or absent matrix spike and the duplicate QC samples can be prevented. It is paramount that you hold the laboratory responsible to produce results that are representative of your sample matrix and that are true. The next article will focus on how your business will develop a quality plan for your laboratory service provider with a specific focus on the California Code Of Regulations, Title 16, Division 42. Bureau Of Cannabis Control requirements. 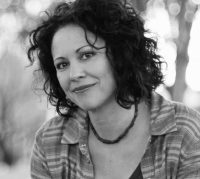 Dr. Hope Jones, chief scientific officer of C4 Laboratories, believes there are a number of opportunities for cannabis growers to scale their cultivation up with micropropagation. 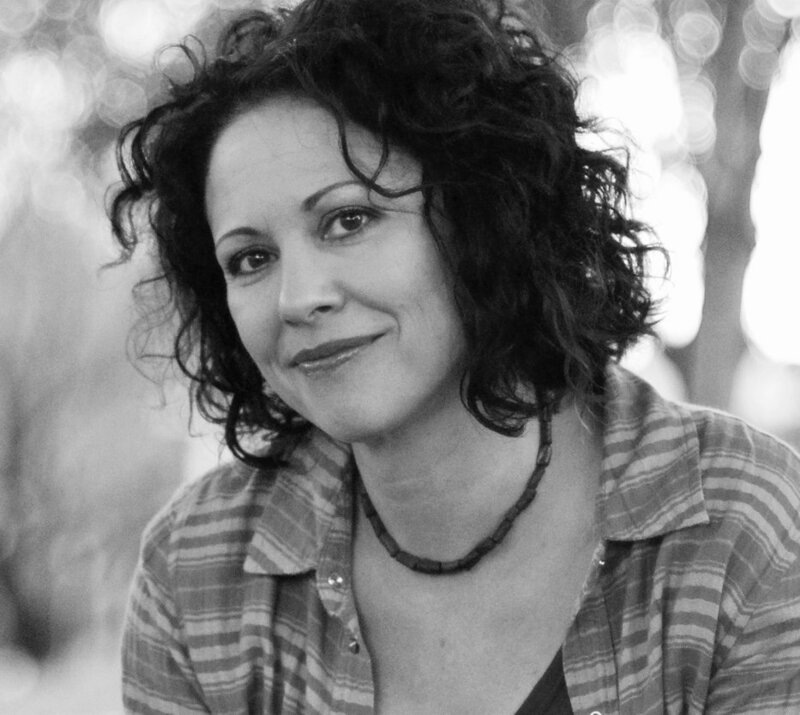 In her presentation at the CannaGrow conference recently, Dr. Jones discussed the applications and advantages of tissue culture techniques in cannabis growing. Dr. Jones’ work in large-scale plant production led her to the University of Arizona Controlled Environment Agriculture Center (CEAC) where she worked to propagate a particularly difficult plant to grow- a native orchid species- using tissue culture techniques. With that experience in tissue culture, hydroponics and controlled environments, she took a position at the Kennedy Space Center working for NASA where she developed technologies and protocols to grow crops for space missions. “I started with strawberry TC [tissue culture], because of the shelf life & weight compared with potted plants, plus you can’t really ‘water’ plants in space- at least not in the traditional way,” says Dr. Jones. “Strawberries pack a lot of antioxidants. Foods high in antioxidants, I argued, could boost internal protection of astronauts from high levels of cosmic radiation that they are exposed to in space.” That research led to a focus on cancer biology and a Ph.D. in molecular & cellular biology and plant sciences, culminating in her introduction to the cannabis industry and now with C4 Labs in Arizona. Working with tissue culture since 2003, Dr. Jones is familiar with this technology that is fairly new to cannabis, but has been around for decades now and is widely used in the horticulture industry today. For example, Phytelligence is an agricultural biotechnology company using genetic analysis and tissue culture to help food crop growers increase speed to harvest, screen for diseases, store genetic material and secure intellectual property. “Big horticulture does this very well,” says Dr. Jones. “There are many companies generating millions of clones per year.” The Department of Plant Sciences Pomology Program at the Davis campus of the University of California uses tissue culture with the Foundation Plant Services (FPS) to eliminate viruses and pathogens, while breeding unique cultivars of strawberries. 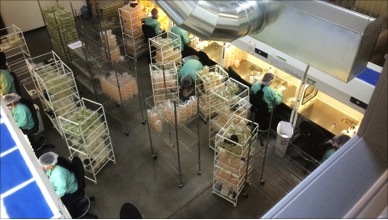 A large tissue culture facility run in the Sacramento area that produces millions of nut and fruit trees clones a year. First, let’s define some terms. Tissue culture is a propagation tool where the cultivator would grow tissue or cells outside of the plant itself, commonly referred to as micropropagation. “Micropropagation produces new plants via the cloning of plant tissue samples on a very small scale, and I mean very small,” says Dr. Jones. “While the tissue used in micropropagation is small, the scale of production can be huge.” Micropropagation allows a cultivator to grow a clone from just a leaf, bud, root segment or even just a few cells collected from a mother plant, according to Dr. Jones. Cannabis growers already utilize the properties of totipotency in cloning, according to Dr. Jones. 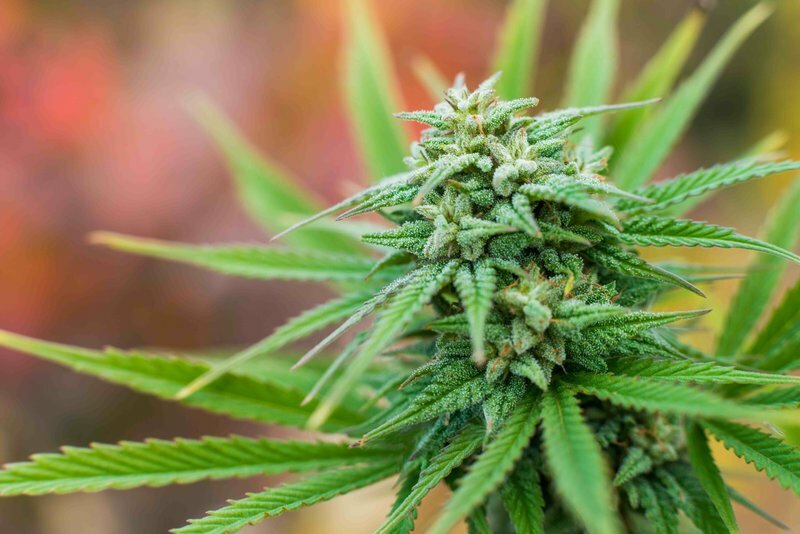 “When cloning from a mother plant, stem cuttings are taken from the mother, dipped into rooting hormone and two to five days later healthy roots show up,” says Dr. Jones. “That stem tissue dedifferentiates and specializes into new root cells. In this case, we humans helped the process of totipotency and dedifferentiation along using a rooting hormone to ‘steer’ the type of growth needed.” Dr. Jones is helping cannabis growers use tissue culture as a new way to generate clones, instead of or in addition to using mother plants. 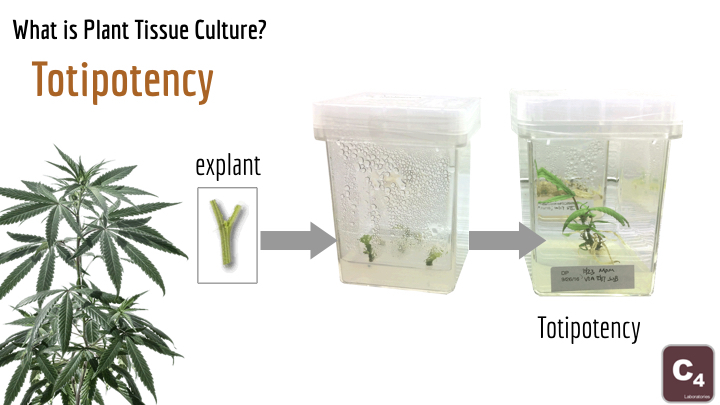 Having existed for decades, but still so new to cannabis, tissue culture is an effective propagation tool for advanced breeders or growers looking to scale up. In the next part of this series, we will discuss some of issues with mother plants and advantages of tissue culture to consider. In Part 2 we will delve into topics like sterility, genetic reboot, viral infection and pathogen protection.